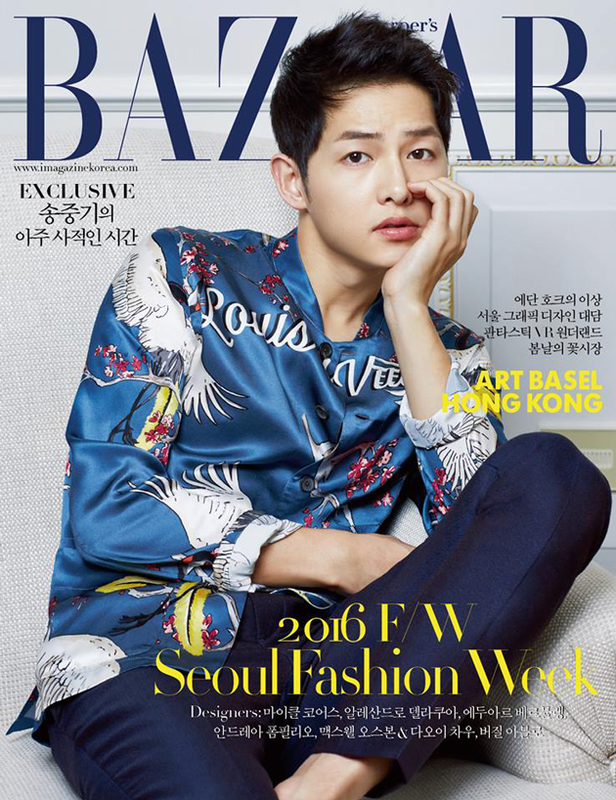 Harper's Bazaar spends a day with Song Joong Ki as he hangs out in and around Hong Kong's swanky Peninsula Hotel. The magazine's May 2016 cover star is clad in a boldly emblazoned Louis Vuitton shirt and wears other pieces from the label's Spring/Summer 2016 collection throughout this very extensive editorial. The charismatic 31 year old actor who won the hearts of many the world over for his portrayal of Yoo Shi Ji in Descendants of the Sun might just be the most popular celebrity in Asia right now (Song Joong Ki syndrome is a thing!) but he still remains ever so down to earth. When questioned recently about his status as a Hallyu star (Hallyu is a term meaning “Korean Wave” that refers to the outflow of Korean culture to other countries), Joong Ki humbly replied that he can't get used to the idea of being a Hallyu star, crediting it to the overwhelming success of DOTS. Instead he pointed to his Descendants of the Sun leading lady Song Hye Kyo and his best friend Lee Kwang Soo of Running Man fame as true Hallyu stars. It's nice that he's not letting this fame get to his head and choosing to focus on continuing to work hard and challenge himself as an actor. This photoshoot took place a few days after Song Joong Ki and Song Hye Kyo's HK ViuTV press conference. The bird emblazoned fashions are pretty ugly but the more classic and graphic looks he is wearing are nice especially the maroon sweater with the blue arrows. Joong Ki is back to his signature flower boy image here. Personally I thought his Yoo Shi Jin look was hotter but he's mighty fine nonetheless and his hair looks phenomenal. The credit for that has to go his new stylist Lee Hye Young who is coincidentally Song Hye Kyo's longtime personal hairstylist. It's interesting how these two now share a hairstylist as well as the same circle of friends. Yes I still believe that SongSong are dating especially since neither none of them have actually outright denied it. Anyway let's enjoy Joong Ki's magnificent hair while we can since he will be shaving his head for his role as a freedom fighter in Battleship Island which begins filming in July. In the meantime he's fast becoming the CF king of Asia as it seems like he is signing a new endorsement deal every day lately. Check out Joong Ki in this Harper's Bazaar editorial from 2013 where he was featured alongside Won Bin and Jo In Sung who happen to be two of the actors who turned down Descendants of the Sun before he was cast. While they both have an edge in terms of looks and height, I can't imagine anyone else but Song Joong Ki as Yoo Shi Jin! Okay is it bad that I find myself wishing I had some of his fashion pieces lol. I love shopping in the mens department at times, you can find a lot of interesting in that department. And I'm totally loving those pants and that jacket. Lvely post as always Rowena :). He is a super cute actor! I really should watch Descendants of the Sun! He looks so young and fresh, very cute. He rock that fashion, have a lovely weekend. Oh, I think that the Louis Vuitton items look gorgeous! So luxurious and so different. I approve! So young but full of charme!!! Such amazing photos - I love how he has been styled (I'd happily wear that cable knit jumper myself haha) and the photography is flawless. Thanks for sharing, Rowena! this is crazy, but i want the sweater he's wearing!! Well, hello there, SJK:D Hehe....I can just never get enough of him! And it's even better that he's remained humble despite all his fame...swoon...I finished DoTS yesterday. I don't think I've ever cried so much over a TV show as much as I did on Episode 15. Song Hye Kyo was amazing in that episode. You're right about her character...it did take awhile for Dr.Kang to really shine IMO, but shine she did:) And how awesome is that that the last scene was in Vancouver...hehe...it would be really great if they did another season, you know? PS So happy those actors turned down the role. I can only picture SJK as Capt. Yoo! Promising young man. He so deserves that cover. I like him a lot. I watched an interview of his and he was very humble and down to earth. I am happy for the success and attention DOTS actors get! He's such a babyface! I love the LV shirt. Hi sweetie! Have a nice weekend! He is such a cutie pie and he certainly rocks that fashion. 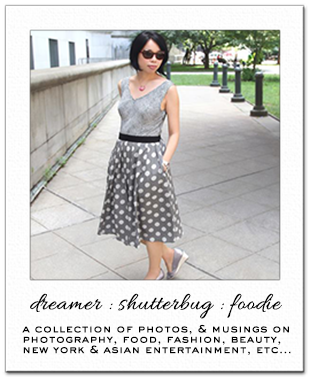 I love your eye candy editorials, so keep them coming, doll :) Happy weekend, Rowena. Oh, I can get that 'Song Joong' appeal!!! He embodies that boyish charm! Some man just have that boyish charm and energy...and he has pleanty of it. Very adorable actor and it is good to hear he's also very down to earth. As far as editorial goes, I absolutely loved it!...and I actually do like those florals:):) Gorgeous clothes, perfect styling, awesome photography and a star full of a charisma and energy...basically everything one needs for a phenomenal editorial. Yes it is nice to come across some in the "media" that is humble, seems in this age of reality TV, social media and selfies this can be hard to fine. Shaving his head, on no! Though some actors look better with shaved heads. I thought the actor that played Shane looked better with his head shaved. The new face of Korea, literally! I haven't watched DOTS yet but seeing these photos of Song Joong Ki has me wanting to binge watch it now. I had to come past here now to tell you I found where to watch this and am getting ready for episode 1 (with subtitles!) YASSSS! I CAN NOT WAIT! Oooh yes very impressive, lots of good shots. I love the outfits especially the blue jacket with the white birds, wouldn't mind having it myself. I haven't seen DOTS, hopefully soon, but I've already seen his photos around, a rising star indeed! He is a cutie! Let's see how long will it take for him to get overwhelmed by fame:) Great editorial! Hope you are enjoying your week, Rowena! Woot! Thanks for letting me know about the vid, Rowena;) I actually looked for this magazine, and will keep looking around here. Perhaps, it's time for a visit to Koreatown...hehe....my husband just shakes his head. Slippery slope, I tellz yah! And I'm actually thinking of watching My Love From Another Star to tide me over...21 episodes though, and no SJK!